The 4th of July is right around the corner, and in just a few weeks, the 2012 Summer Olympic Games will commence in London, so we are currently being drawn to spaces featuring the stars and stripes and color schemes of red, white, and blue. As we prepare to say “Happy birthday, America!” and cheer for Team USA, let’s celebrate with some “star spangled spaces.” Enjoy! 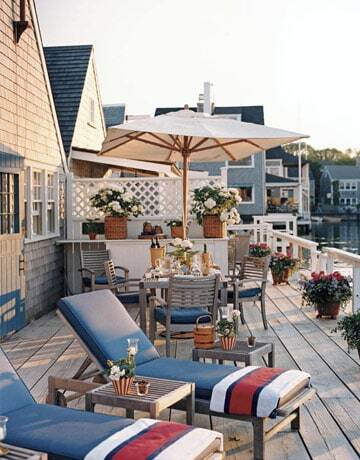 A perfect patriotic deck ready for a 4th of July cookout and fireworks over the water! An all-American cabin decked out in the stars and stripes. Aqua gives red, white, and blue color schemes a refreshing new look. What a clever way to include a pop of patriotism into a room! Nandina Home & Design would like to wish all of our readers a very safe and happy 4th of July holiday and the best of luck to the Team USA athletes who will represent our nation at the 2012 Summer Olympic Games!